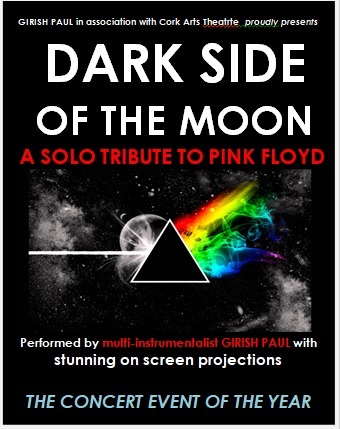 Experience not one, but two classic albums by the legendary Pink Floyd, WISH YOU WERE HERE and the classic DARK SIDE OF THE MOON performed live in concert and in their entirety, with live instruments and vocals, studio quality recordings and sound effects, and stunning on-screen visuals throughout. Sit back and let the music transport you from the depths of the oceans to the reaches of outer space. Singer-Songwriter Girish Paul’s albums are cut at the world famous Abbey Road Studios where Pink Floyd recorded one of the greatest albums of all time, Dark Side of the Moon. As a singer-songwriter Girish has worked with the likes of John David (Robert Plant, Status Quo), Nick Webb (Paul McCartney, Pink Floyd, Phil Collins) and his new album JourneyMan released worldwide was mastered by Pete Maher who has worked with Irish band U2 and The Rolling Stones.